Looks good, John. 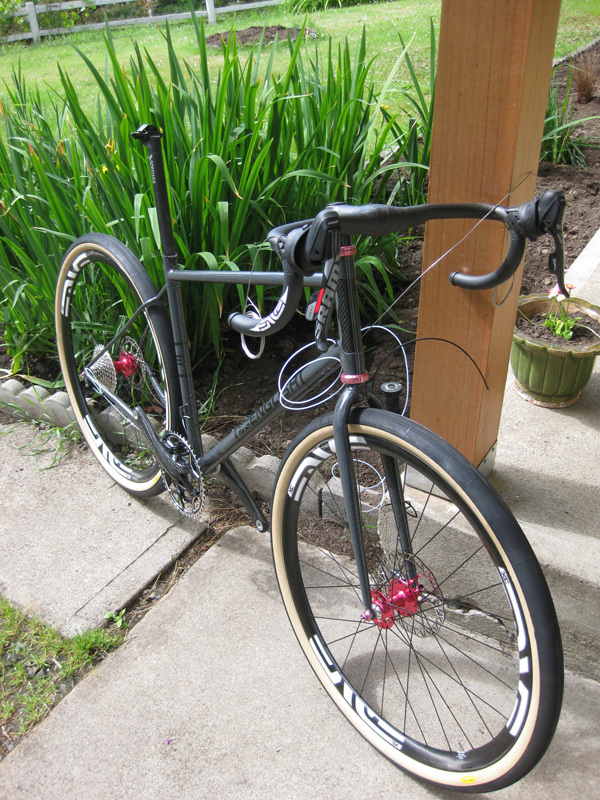 Are you building that with disc brakes or just using the wheels from another bike for the time being? Nothing seems more polarizing then putting discs on a road bike! Excellent craftsmanship. Ride it like you stole it! It’s a disc-brake bike. TRP Spyres, in fact. I love it John. At first look the contrast between the broad muscular fork, fat tires and skinny seat stays seems a bit odd, but I can get used to that fast. There are two things I personally would change. The unified bar/stem looks out of place to me as the rest of it is so profoundly mechanical looking, that seems incongruous, and those decals on the wheels. As you already know I am never a fan of them but in this case, they seem somehow insulting. I hope that you will peel them off. Again, you and English working together make something totally out of the ordinary happen. Look forward to watching you break it in. No fender or rack mounts, eh? It’s just my thing, but if the tires are fatter than 28, I provide for both. It might just be the perfect bike for riding D2R2, fast. The bike is built for a purpose: going long distances with comfort and speed. I did not have any intention for this bike to be anything more or less than my current English, I just wanted to be able to fit really fat, fast 650B tires. So no racks, fenders, or anything else that would differentiate the bike from a conventional racing bike. Regarding the decals on the wheels, Rob actually gave me the choice of getting black or no decals, and I must not have been paying attention or thinking, because I said just leave ’em. Now, of course, I wish I would have gotten the black. I’ll probably end up doing some peeling. The Calfee BarStem is the same as on the 700C English. I like it! This rig is awesome! I’ve been an English fan for some time, and this is right up there with my favourites, the first 650B I’ve seen. This looks like so much fun, I just want to ride it! The Hetres should serve well for the not too gnarly stuff, and there are some other nice 650bs out there for more gnar, if that’s what you are into. For D2R2, I think this will be fantastic. I’ll be on my Niner MCR converted to drop bar mode, and my buddy Iain will be on his Waltworks, adapted the same way. On the way home from D2R2 last year, we agreed we needed more volume. Clearly, we are not alone! I look forward to seeing this beauty complete, and perhaps, in the wild.